Dave Pitcher , John Storrie, Les Bensley, Phil Underwood, Pete Warner, Fred Dear, Ken Menzies, Ralph Petts, Pete Mosedale, Mike Prestcote, Shaun Chandler, Simon Wade, Phil Nixon ............ were the first of the few!! The Kettle Club was formed in late August 1995 at Standlake Oxfordshire, England by 14 Suzuki GT750 Kettle owners from various counties within the UK, now known as “The Standlake Few”, all with an obvious interest in owning and riding or just interested in the inimitable Suzuki GT750. The seed was sown from an even smaller number of enthusiasts, the majority of which were members of other classic Japanese motorcycle clubs. However, there was no specific club for the Suzuki GT750 and with other classic single marque clubs emerging we thought it was time that the Kettle was put on the map and in a big way. As one of the emerging classics with an ever growing following we did think it was time for the Kettle to take the stage on a thriving market to encourage its promotion to the forefront of the classic bike we all want to cherish and ride!! The Kettle Club is only one of a very small number of single marque clubs in existence and without doubt, one of the most successful and we think the best! Not only is The Kettle Club a thriving single marque club, we are also a very successful motorcycle club in the general sense of the term with rideouts, meetings, help with repairs, spares and sales and a great deal of communication between Members. Also there are discounts available for Insurance and parts providers, with assistance in verifying model identification for UK registration purposes. In the first three years of the Kettle Club’s existence we attracted well in excess of 400 members and by the beginning of November 1998 our membership has exceeded 500. Our press coverage and many of our Members bikes have been seen around the world in various classic motorcycle magazines. 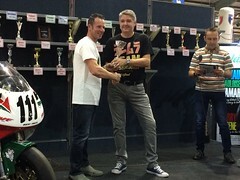 In October 1997 & 1999 the Kettle Club won the coveted award of "Best Club Stand" at the Classic & Motorcycle Mechanics Show at Stafford with one comment from the show’s organiser in 1997 that our amazing display of 29 individual Suzuki GT750’s was "the best club stand ever in the history of this particular show”. 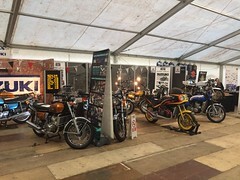 Another influential motorcycle magazine thought our stand would not have looked out of place at the National Motorcycle Show at the Birmingham NEC, true praise indeed!. 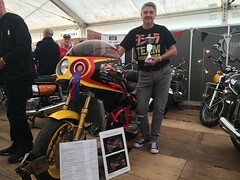 In August 1998 the Kettle Club won another prestigious award, namely 'Best Club Stand' at the Vintage Motorcycle Club’s event, 'Festival Of A Thousand Bikes', held at the world famous race circuit Brands Hatch. This was the pinnacle award for the Kettle Club. The Kettle Club was the first club for Japanese motorcycles in the seventeen year history of the event to be selected as the “Featured Club”. With a spectacular display of 61 Suzuki GT750s parading and later having a free for all around the circuit (in both cases having the track all to ourselves!) was without doubt one of the most exciting motorcycling moments ever for our members, a never to be forgotten moment. A spokesman for the V.M.C.C. reported in the motorcycle press that , “ The Kettle Clubs fantastic display has set standards that other clubs are going to have great difficulty matching”.